Yes…I sang that song that Chef from South Park sings while making these. Goodtimes, granted these aren’t salty. I learned a version of this recipe from a lovely lady my parents knew back when I was a kid. So yes, they are so easy even a kid can make them. Assuming like my parents you trust said kid around the stove….or have no choice since the kid made them when you went out. Ha. Oh yes, it has been a confection filled winter’s night at the hungry hobbit household this year. Combine grind the dates in a blender until broken into really small bits. Add the peanut butter and icing sugar. Blend until fairly smooth. Using a tbl measure out the amount for each ball. Form the mixture into balls, place on a plastic wrap covered sheet and place in the freezer to firm up. Atleast 2 hours. Melt the chocolate using the method from the tortoises recipe. 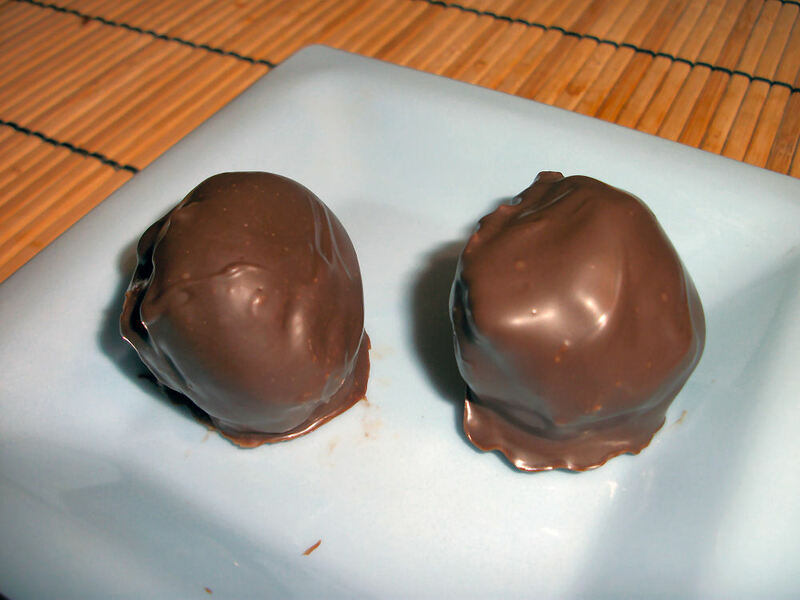 Cover each ball in chocolate and return them to the plastic covered sheet. Allow to cool, serve or keep in a sealed container for later. Makes 12 chocolate not so salty balls. Each ball contains 75 calories, 4.5 grams of fat, and 1 gram of fibre. Enjoy, and have a happy new year everyone! Next week I will weigh in and see if any damage from the holidays has been done. The goal was to maintain but enjoy over the holidays. So, I figured with tasty but healthy treats like these and using proper judgment maintenance should be achieved. Stay tuned! I’ll be stepping on the scale just like everyone at the end of this weekend. This entry was posted in Dessert, Snack and tagged chocolate, Date, peanut, vegetarian. Bookmark the permalink. I must say that whenever chocolate is in the equation, the situation is undoubtedly enhanced! It’s kind of amazing that dark chocolate can actually be good for you when eaten in reasonable sizes.